Michael Larsen - Kobelco Construction Machinery Europe B.V. 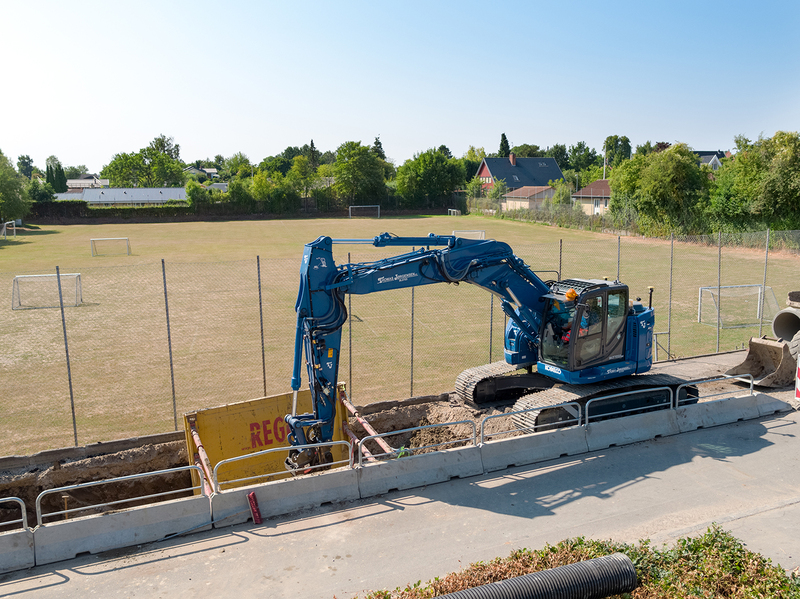 In Fredensborg, located just 30km north of Denmark’s capital Copenhagen, construction specialist Thomas Jørgensen has been contracted to upgrade some underground sewerage pipes after a number of houses in the area flooded. Michael Larsen, who part-owns the company, is no stranger to getting his hands dirty and is currently using a Kobelco SK270SRNLC-5 to replace the pipes. Michael and his team have already been on-site for three months, but the project is expected to take another month to complete. Michael, who has worked in the construction industry for more than 20 years, first uses the SK270SRNLC-5’s bucket to break the road asphalt before digging through the various layers of rocks, limestone, sand and clay to a depth of approximately three-and-a-half metres. 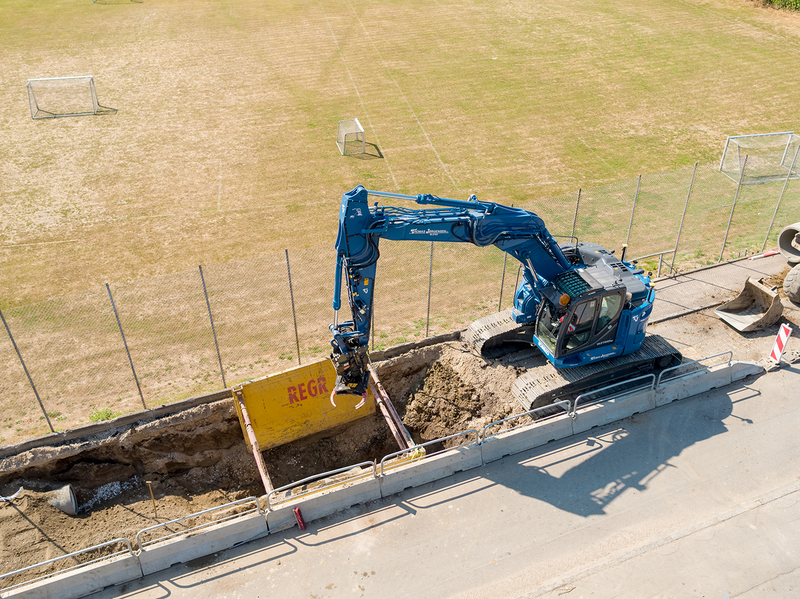 The trench he is currently digging is around 300m in length, but the network of replacement piping will cover a total distance of 600m when completed. The clay at the bottom of the trench is waterlogged and unstable, so Michael loads the SK270SRNLC-5, which has been painted in Thomas Jørgensen’s blue colour, with 16-33mm pieces of gravel. He then tips them into the trench to even the ground, making the floor level and more stable for the new pipe. A temporary iron trench box is also lowered into the trench to keep the walls, which weigh 5,500kg, stable. Using the machine’s quick coupler, Michael quickly removes the bucket and hooks a thick chain onto the end of the boom. He then attaches this to a section of the concrete sewer pipe and lowers it down precisely into the trench. Each section of pipe weighs around 3,700kg, but the SK270SRNLC-5 remains stable throughout the lifting operation. 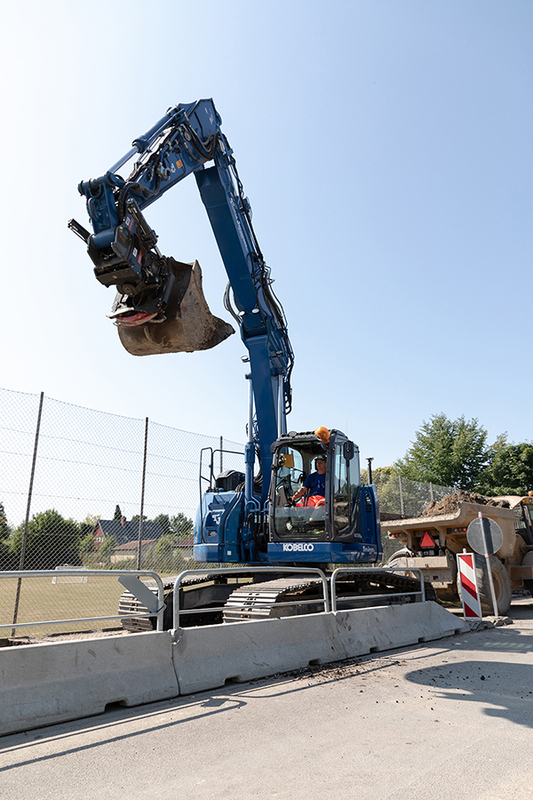 The SK270SRNLC-5 is a short radius machine with a narrow undercarriage, which means that it has a small working footprint and is ideal for operating on job sites where space is restricted. It also complies with strict transportation regulations. 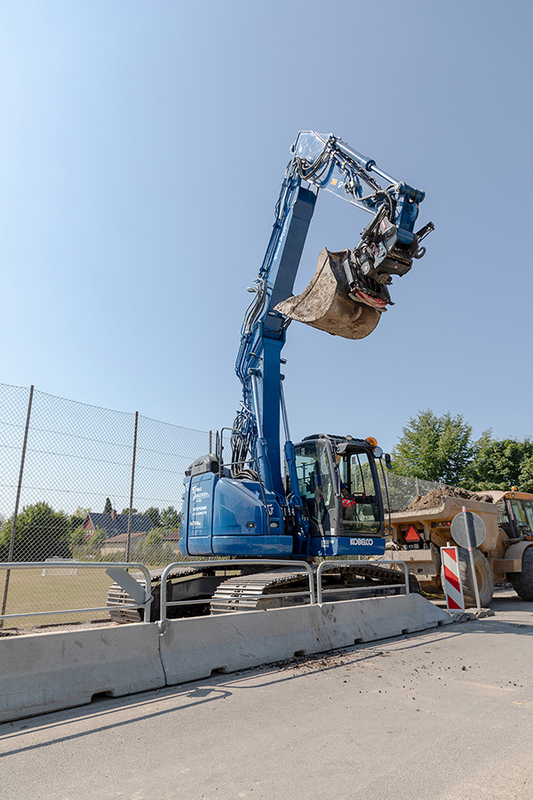 This is particularly useful for Michael, as it means he can position the machine right up against the fencing of the football pitch at the side of the road, taking up much less space on the road so local traffic can still pass by, causing less disruption. 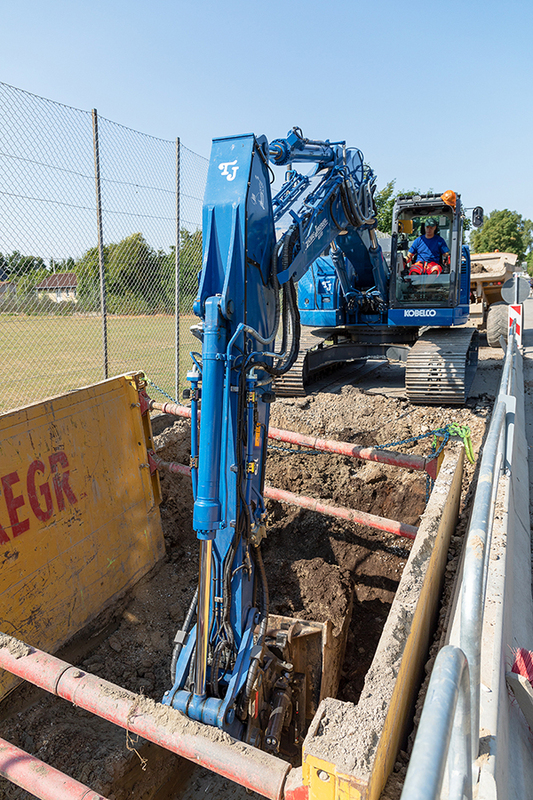 The compact SK270SRNLC-5 allows Michael to operate a continuous 180° dig, swing and load action within a working space of just 3.68m. “Without the Kobelco SK270SRNLC-5, working on this job site so close to the road would be impossible for us,” explains Michael. “This is actually one of the reasons why I chose this machine. 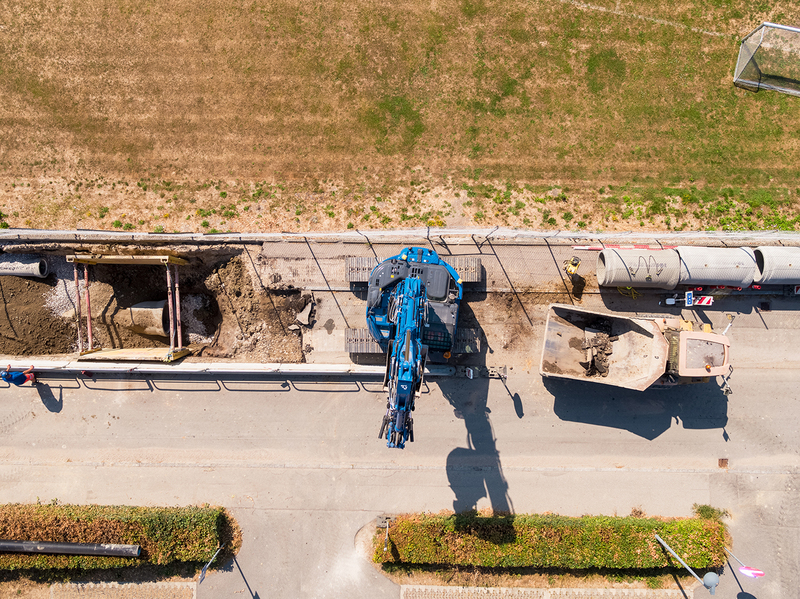 Our company, Thomas Jørgensen, specialises in utility work, like sewerage pipe replacement, and this means we sometimes have to operate our equipment in the middle of busy cities. 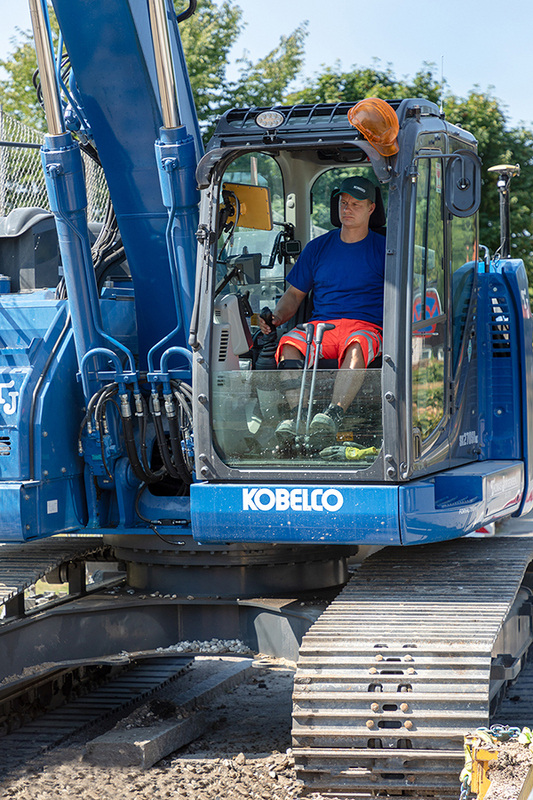 A machine that takes up less space on the job site is a big advantage for us. 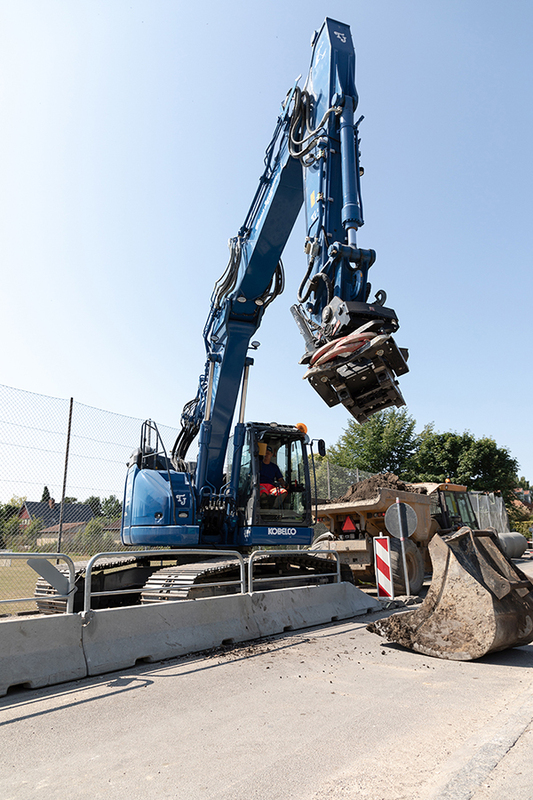 As well as being compact, the Kobelco SK270SRNLC-5 is also equipped with Kobelco’s innovative iNDr (Integrated Noise and Dust Reduction Cooling) technology. This superior method of noise suppression delivers low noise operation, exceptional engine cooling, enhanced reliability, minimal machine downtime and a more comfortable working environment for the operator. In fact, the machine boasts the lowest surrounding noise in class (97 dB(A) and has among the lowest noise level at the operators’ ear (70 dB(A). For this particular job site, which is in a quiet residential area, the addition of iNDr technology is very important. Not only does the SK270SRNLC-5 promote extreme low levels in surrounding noise but it enhances the operator’s in-cabin environment. The integration of iNDr also makes a significant impact in environmental wellbeing, which is particularly relevant for Denmark as the country enforces a number of strict environmental policies and takes climate change very seriously. Michael’s dedication to his work is clear when, at the end of our visit to this job site, he rolls up his sleeve to show us his tattoo – a sketch of him replacing pipes on a job site!